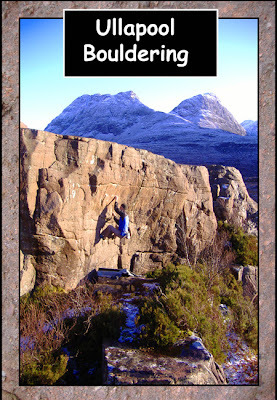 Ian Taylor has produced an informative and accurate guide to the bouldering round Ullapool. 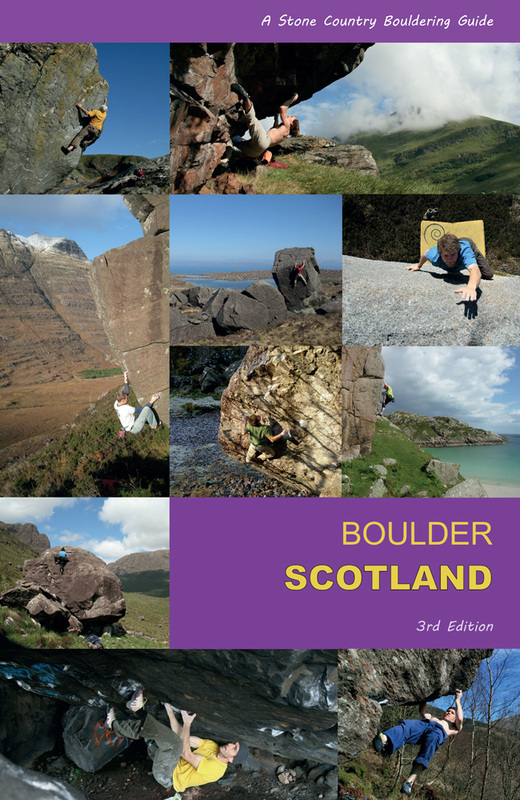 It includes the classic areas such as Reiff, Reiff-in-the-Woods, Ardmair and Rhue, but also some more recent venues such as Cnoc Breac, Tigh-na-Mara, Ullapool Hill and the Goat Boulder. 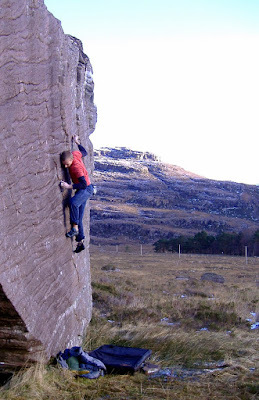 The area is almost exclusively Torridonian Sandstone, which is similar to but redder than gritstone, it's older and harder and isn't as green... so this is truly a gritstone climber's mecca. 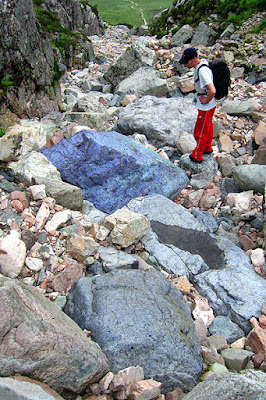 If you visit these areas you will also find as many projects and new rock as you could wish for. 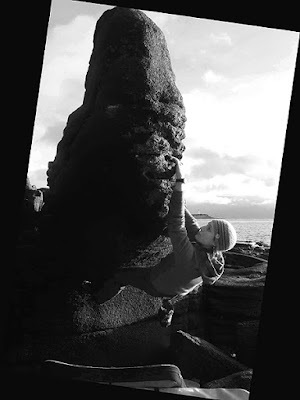 Ullapool is a fine base for exploring Torridon, Coigach, Assynt and the far northwest...the camping is good, the beer is good, and even if the midges are bad in summer, areas such as Reiff tend to catch the windiest, sunniest weather, so it's an all-year-round venue for the boulderer. 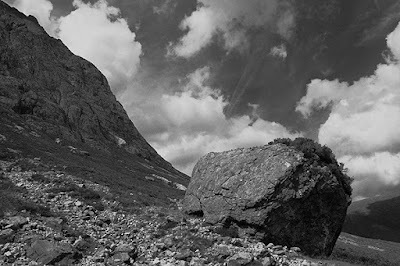 Just got back from Torridon where I managed to climb south face of the ship boulder via the slim groove on the right hand side. Ian pointed me at this a few weeks ago and it's a great line, visible from the road as you come down the Glen. It looks like it should be fairly easy as it contains the only real features/holds on the face, and these look massive compared to the blank wall to the left which is just covered in shallow ripples and pebbles. However...It ended up being much harder than it looks, reachy, crimpy and tenuous. 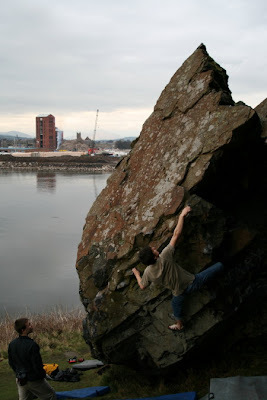 I wanted to climb as direct as possible into the groove and found a 'French' start off the mat, stepping on and catching a crimpy pinch thing, then spanning out right for a good crimp. Turn the pinch into a sidepull for the left hand, work feet up and go again for a smaller but positive crimp with the right. Then left foot up onto a smear and slap up into the groove with the left hand for a good crimp just under the obvious flat jug. Get the jug, match it, build the feet up and over with the right hand for the spike on top. Job's a good 'un. 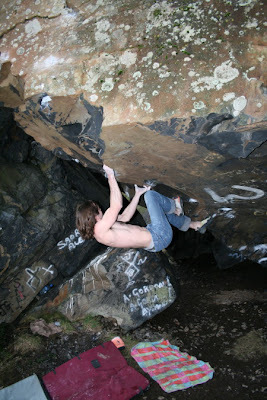 Tom Charles-Edwards finally cracked Turbinal Nose at Glen Croe, saying it is maybe 7b+ if you're tall...it's proving a popular project problem and one of the gems of Glen Croe. Carrick Castle continues to be worked, though the projects are so hard that there may not be much news for a while...however, there is a supposed Traverse of the Gods on the crags up there, so hopefully we'll get some photos soon. John Watson found some new lines in Glen Coe, the highlight being a V7 on the Rannoch Moor stones, named Galtee Merci - a superb granite roof with holds!! 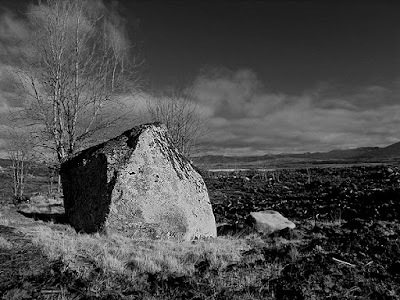 The boulders and problems are pretty obvious as you pass the burnt forestry on the Rannoch moor, and yes, the boulders are bigger than they look. 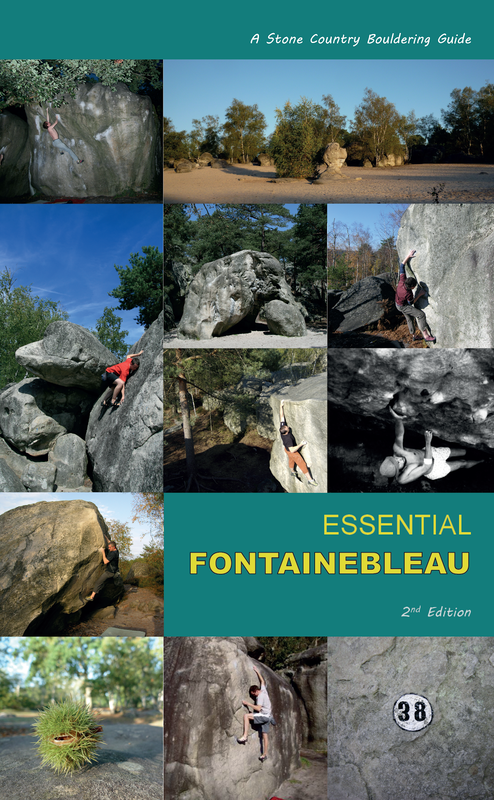 BTW there are girls bouldering too, lest I be accused, but really there should be more new stuff from the lassies, come on where are you? 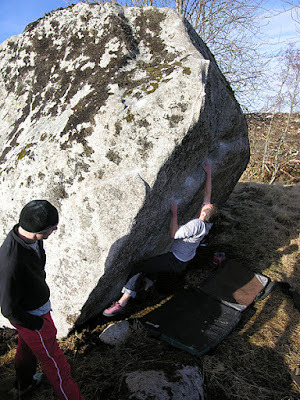 Claire Youdale is living on Arran and working round the venues there.. she reports enjoying the gabbro of Kildonan... lots of very enjoyable problems here, though usually there is a fine cushion of sand under the walls. 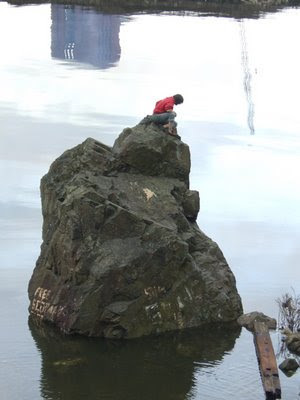 What is it about some stones? They can look meaningless from a passing car window -you stop, pull the binoculars to the eyes just in case and they still look ignorable... a lot of boulders you walk into shrink to sad lumps like deflated footballs. However, I've long learnt to keep an open eye and mind...sometimes you are rewarded, the stones swell in size, you downsize next to them as though you stepped through a shrinking machine - I'm convinced there are cosmic wormholes next to some of these things! 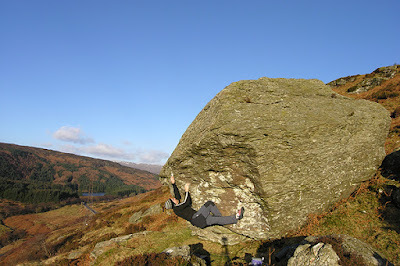 Point in case: I pulled up at some boulders I'd spied in the burnt tangled wreck of an old forestry plantation, convinced they weren't worth the effort and was pleasantly surprised to find one of them at least almost highball... with some super slab problems and a clean granite roof (with holds!) which proved to be a superb V6. It's been a good period for boulder hunting - tall blue skies and still cold days when you sweat into your boulder mat and your fingers enjoy the dry rasp of chilled rock. Folk have been busy working projects or exploring new areas and I like to think of all these touched stones going on like lamps across the country... it's all just a temporary illusion of course, but it's meaningful for that day, turning the stone a different colour for a while... why not?